A Pacific Gas & Electric Co. worker locates a gas main line in front of a home during the Camp Fire in Paradise, Calif., in November. (Bloomberg photo by David Paul Morris). California’s largest power company intends to file for bankruptcy as it faces tens of billions of dollars in potential liability after massive wildfires that have devastated parts of the state over the past two years, according to a filing with the Securities and Exchange Commission. The California wildfires, which have killed dozens of people and destroyed thousands of homes, have led to a surge in insurance claims. PG&E estimates that it could be held liable for more than $30 billion, according to the SEC filing, not including potential punitive damages, fines or damages tied to future claims. The company’s wildfire insurance for 2018 was $1.4 billion. The PG&E bankruptcy promises to be more complex and political than most bankruptcies, pitting fire victims, ratepayers, bankers and renewable-energy providers against one another. The company said financial alternatives to bankruptcy would not serve the best interests of PG&E and its shareholders and “would not address the fundamental issues and challenges PG&E faces.” Among the many considerations that pushed the company closer to bankruptcy were the need to resolve its potential liabilities, extensive rebuilding efforts and “the significant increase in wildfire risk resulting from climate change,” PG&E said. PG&E’s shares plummeted 52 percent Monday. Its stock has plunged about 80 percent since early November, wiping out about $19 billion of market value. The filing comes a day after the company announced the resignation of its chief executive, Geisha Williams. Williams, three other top executives who resigned last week and the company have come under harsh criticism in recent weeks over the utility’s corporate culture. The president of the California Public Utilities Commission had in November widened his investigation of PG&E to include its “safety culture” more generally. “In our opinion, [PG&E] has significant organizational and leadership problems that have eroded the utility’s trust capital in Sacramento,” the investment-advisory firm Height Securities said in a note at the time. The company was already on federal probation as a result of a 2010 natural gas pipeline explosion in San Bruno, California, that exposed violations of the Natural Gas Act and obstruction of justice. The five-year probation period runs through this year. PG&E said it was required to give employees at least 15 days notice before it filed for bankruptcy which it plans to do “on or about” Jan. 29. PG&E said that as of last week it had about $1.5 billion in “cash or cash equivalents on hand” and was in discussions with “a number of major banks” to secure more than $5 billion to fund its continuing operations as it seeks bankruptcy protection. As a regulated utility, PG&E has appealed to the California Public Utilities Commission for higher gas and electric rates to recover costs. And the company has appealed to the California State Legislature for protection by capping liabilities stemming from the fires. Few politicians want to rush to the defense of a big utility, but many policy experts argue that PG&E wouldn’t be in this position if it weren’t for a unique California legal standard that makes utilities strictly liable for damages from wildfires linked to their equipment even if the utilities were not negligent or unreasonable. 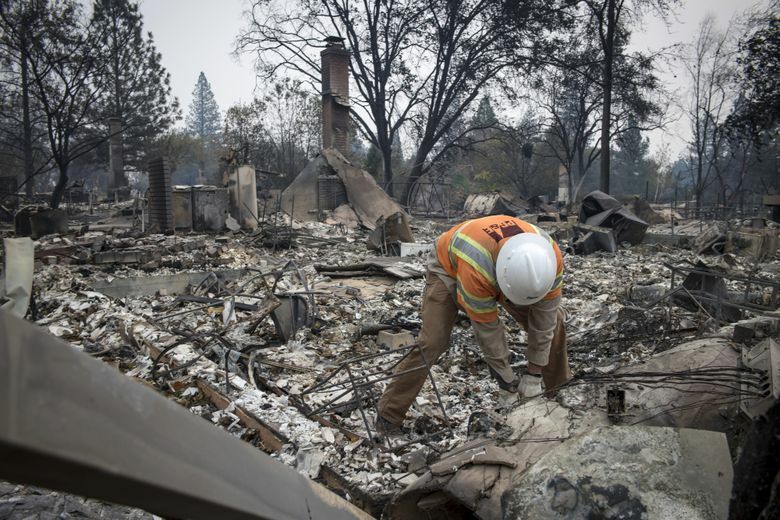 “The report of PG&E’s likely bankruptcy is deeply concerning news for the state, fire victims, and ratepayers,” California State Assembly member Chris Holden, a Democrat, said in a statement. “We don’t want to see the victims victimized again.” Holden, who has been an ally of PG&E, said he would work with the Legislature and the state’s new governor, Democrat Gavin Newsom, on how to protect fire victims and ratepayers. PG&E, formed more than a century ago, has been blamed for dozens of major California fires that have started when trees have fallen on power lines, sending sparks onto dry grass or other trees. In response last May to a report by the California Department of Forestry and Fire Protection (Cal Fire) regarding October 2017 blazes, PG&E said it prunes or removes about 1.4 million trees a year in an effort to prevent such fires. The company, which serves about 5.4 million electricity customers and 4.5 million natural-gas customers, also blamed changing weather for exacerbating the task of preventing fires. “Years of drought, extreme heat and 129 million dead trees have created a ‘new normal’ for our state,” the company said. Moody’s investor-rating service warned Nov. 15 that the potential liability of 21 major wildfires in 2017 was roughly $10 billion and that the destructive 2018 Camp fire, which devastated the town of Paradise, California, and killed 86 people, would add further costs. PG&E said the cause of that fire was still under investigation, but the agency Cal Fire is focusing on several of the utility’s transmission lines and towers. The 2018 fires have compounded concerns about the viability of the company. The Washington Post’s Scott Wilson contributed to this report.